Who will close out the weekend for you? Has The Alec Baldwin Show TV show been cancelled or renewed for a second season on ABC? The television vulture is watching all the latest cancellation and renewal news, so this page is the place to track the status of The Alec Baldwin Show, season two. Bookmark it, or subscribe for the latest updates. Remember, the television vulture is watching your shows. Are you? An ABC TV series, The Alec Baldwin Show is an hourlong weekly talk show, hosted by the Match Game host, 30 Rock veteran, and frequent SNL guest. It features Baldwin conducting one-on-one interviews with American pop culture luminaries. For years, Baldwin has hosted Here’s the Thing, a podcast version of this format on WYNC. It and this TV series feature candid conversations and deep discussions. Guests in the first season include Robert De Niro, Taraji P. Henson, Kim Kardashian West, Ricky Gervais, Jeff Bridges, Mike Meyers, and Cecile Richards. The first season of The Alec Baldwin Show is averaging a 0.23 rating in the 18-49 demographic and 1.36 million viewers. Find out how The Alec Baldwin Show stacks up against other ABC TV shows. 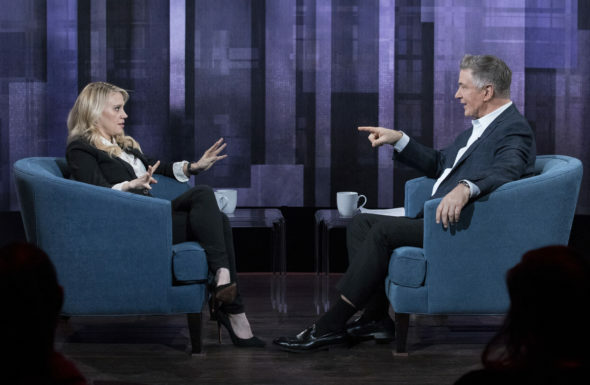 As of April 21, 2019, The Alec Baldwin Show has not been cancelled or renewed for a second season. Stay tuned for further updates. Will ABC cancel or renew The Alec Baldwin Show for season two? The show is drawing very low numbers so I don’t see much of a future for this talk series, especially since the network has sent it to Saturday nights. I’ll update this page with breaking developments. Subscribe for free alerts on The Alec Baldwin Show cancellation or renewal news. Find more The Alec Baldwin Show TV series news or other ABC TV show news. What do you think? Do you hope The Alec Baldwin Show will be renewed for season two? How would you feel if ABC cancelled this TV series, instead? People don’t like the talk show because of Alex’s SNL character? Two very different things. It’s hip and he seems to be a very good interviewer. It’s about the guests, not his SNL character. I love the graphic artist. It’s very NY-ish. Red middle America is that ridged? When you alienate half of your audience – usually the ones that spend money, and you do it with others that have alienated the same people – you set yourself up for failure. I think he does a great job and I like the show! I will not be watching!!! I would not again. Terrible show!